Beth has been a member of Faith Presbyterian Church since 1989 and joined the music staff in 1990 as church pianist. She is active in Sunday School and supports Faith’s youth program as a parent volunteer of a teen. 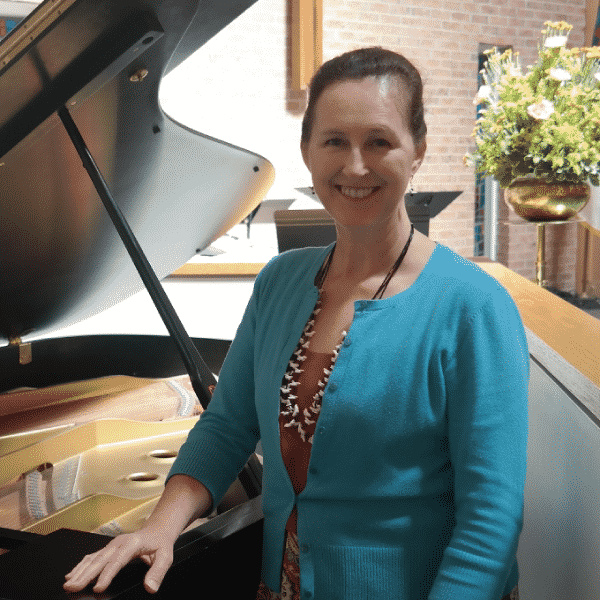 A native of Portsmouth, Virginia having grown up in the Southern Baptist tradition, she is passionate about serving God through music, with harp, piano and her voice. She served in The United States Army Band (Pershing’s Own) located in Washington D.C. for 20 years, as their harpist from 1986 where she has appeared as soloist with The Army Concert Band, The Army Orchestra and for State Dinners at the White House and State Department. In 1982, she received a Bachelor of Music degree from the North Carolina School of the Arts and a Master of Music degree from Florida State University in 1989, with additional studies at the Tanglewood Institute. Before accepting her position with the band, she performed with many orchestras while in Florida, North Carolina, and Virginia.. Currently, she resides in Annandale, Va. with her husband of 29+ years- Karl (also a former member of the band), mother of five, teaches and continues to freelance in the Washington, D.C. area. Her hobbies include: cooking, learning French, camping, and running.